Sorry to bother you all again, but because August is going so fast, I forgot to mention that the prompt book I co-wrote with my writing group is free this weekend. We updated the cover and Prompted to Write is free today through Sunday for those interested. 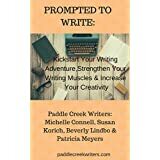 It includes some bio info on each of us, lots of prompts and inspiration for your own writing. Enjoy!